I see the death of Mr. McMahon is set to turn the WWE (well, at least RAW) on its ear, with everyone pointing fingers at each other, in the classic "WHODUNIT?" style. 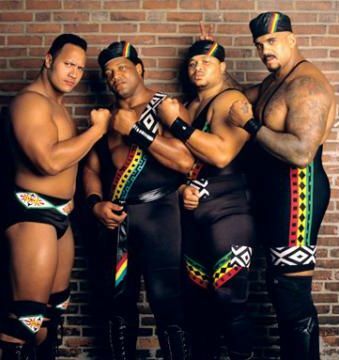 Did you, faithful black rasslin' reader(s), see what I saw... out of the 7 suspects, 3 of them are Black! Bobby Lashley, Coachman and Cryme Tyme are all early (and for at least Lashley and Coachman, high) on the FBI's list. First off, I was initially against King Booker T attacking Lashley like that, but the potential singles matches the two of them could engage in just makes me want the heat to rise in a possible fued, hopefully for a title (or better yet, for Booker T's crown). Cryme Tyme's segment where they were selling off McMahon's belongings was funny, but come on, do you think those two could set up a limo to explode? Out of those 3, I think the culprit COULD BE Coachman, for the sheer greed and power he could obtain, although with so many McMahon's in the stew, it would be plenty hard for Coach to steer the ship himself. The rest of the suspects are kind of weak (come on, the limo driver? Wouldn't he have been IN the limo when it blew up? Paul London seems to be a jerk, and John Cena needs all the hype can get - but he isn't that bright...), even up to Mick Foley. What would he gain for murking Mr. McMahon? While I do not believe ANY of these suspects are the true culprit, I just found it odd how many Black men made the suspect list... I'm just saying!